← What’s Next for Savannah? A Star on the Walk of Fame? Tammy is a big Peyton Manning fan, as I’ve documented here and here, which of course means that she does NOT like Tom Brady. Her originally being from Florida means Tim Tebow ranks well above Brady (but below Manning) and that made last night’s game hard for her to watch. So I made this in an attempt to cheer her up. 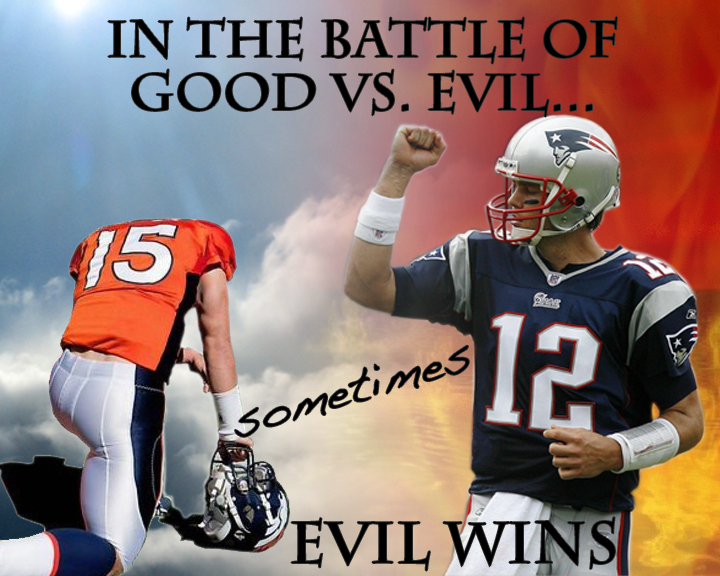 Gallery | This entry was posted in Daily Life and tagged daily life, Football, humor, tim tebow, tom brady. Bookmark the permalink. Of course Eli’s still in the mix (hopefully I don’t jinx him) so she’s still got a Manning to cheer for. Did you really make this graphic? Seems like something that would be very popular on FB! Sadly, I don’t have the guts to post it. Haha… Yeah, I made it. Started working on it a little after halftime. I posted it on my FB page and on the Twitter but feel free to post on yours too.